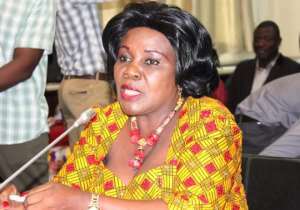 Aviation Minister Cecilia Dapaah, on Tuesday, gave an assurance that the Ministry is collaborating with other stakeholders in the industry to make air transport safe and also curtail the re-occurrence of accidents in future. She made ths known on the floor of Parliament, in an answer to a question, which stood in the name of Mr Kwame Governs Agbodza, the Minority Spokesperson on Roads and Transport and MP for Adaklu, who wanted to know the cause of the Starbow crash last year. Madam Dapaah said the failure by the cockpit crew of a Starbow airline to execute the correct procedures in aborting the take-off caused the plane's crash at the Kotoka International Airport on November 25, last year. The Minister said a number of measures is being pursued, including the review of the operational control of Starbow to ensure that it hires adequate qualified operational personnel. Madam Dapaah said Starbow is to arrange a retraining of its crew to include Cockpit Resource Management (CRM) and aborted take-off procedures, and directed Starbow to ensure that the Airworthiness Directive (AD) No 2016-0256 is effected on all subsequent ATRs before they are added to their fleet. Also Pilots should also exercise extra caution when taking off in adverse weather conditions. She announced that the Ghana Civil Aviation Authority (GCAA) is to establish a standing preliminary investigation team with approved procedures which will include the authority to request medical and toxicology tests. Other measures are that the Ghana Airports Company Limited would review it Standard Operations Procedure (SOPS) and responses of all respondents, and also the Management of Air Traffic Control of the GCAA to ensure that all staff are familiar with the requirements of accident and incident procedures contained in SOPs. The Minister recalled the establishment of a five member committee last December to investigate the accident in order to ascertain the 'probable cause(s)' of the accident and make recommendations to prevent future occurrence. The investigation came out with the finding that Starbow Flight IKM104 started taxing at 1214 hours for departure to Kumasi; and there were 60 passengers, three infants and five crew member. The weather at the time was clear but deteriorated rapidly and resulted in a heavy downpour before the pilots were ready to takeoff. During the takeoff run, the aircraft drifted off the runway without the crew appreciating it as a result of the severity of the weather. In the process, the captain's seat moved rearward, which made the captain transfer control of the aircraft to the co-pilot. At this point, the aircraft was virtually off the runway. The crew initiated action to bring the aircraft to a stop but did not follow the correct procedures, most importantly, they did not select reverse thrust, which would have slowed down the aircraft much faster. The Minister said there was also lack of adequate co-ordination among the crew during the flight. According to the Madam Dapaah, there was a reported case of one passenger, who was severely injured and some injuries as well as the damage of the Precision Approach Path Indicator light and inner perimeter fence at the KIA.